Ralph Bruning was born in 1945 in San Diego, Calif. Ralph’s father was career Navy, therefore, the family moved often, and finally settled in 1959. Ralph graduated from Wasson High in 1963 and received a B.A. degree from Western State College in 1968. He began his racing career the summer of 1966, when he decided to enter the Pikes Peak Hill Climb. He drove his street car, a 1964 4-cylinder Sumbeam Alpine convertible, in the sports car class. His time was unmentionable as even the pace car’s time beat his. Ralph enjoyed the race so much that he bought a used sprint car and raced at Belleville, Kansas. There, he flipped end-over-end on the oval track, but was unscathed. He was determined to continue racing. 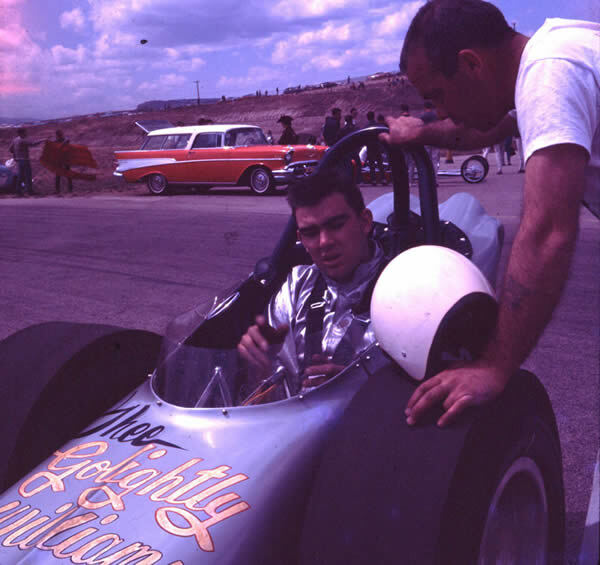 The sprint car was repaired and raced in the 1966 Pikes Peak Hill Climb, in the championship class. After racing that car for two years, he built a beautiful Chevy Chevelle. By then, Ralph had married Marcia Mendrop and started a family. In 1972, Ralph and his family moved to Lawton, Ok for a short time on a business venture. The Chevelle was completed in 1972, and Ralph again entered the Hill Climb, this time finishing 6th. In 1973, The Brunings moved to Wichita, Kansas, but again returned to Colorado Springs for the Pikes Peak Hill Climb. This race marked his first victory. The family moved back to Colorado Springs in 1974. Ralph’s new job was the service manager for the Saab/Subaru dealership. His second and third wins were back-to-back in 1976 and 1977. In 1979, he drove for Silliman Racing Enterprises from Albuquerque. Ralph totaled the car during the first day of practice on the bottom section. He pulled the team together, along with many friends and businesses, and rebuilt the car in 48 hours. We won the race for the 4th time. In 1980 Ralph decided to change careers at the age of 34 and graduated from the Colorado Springs Police Academy. He spent 19 years on the force and was awarded two Medals of Valor and one Medal of Honor. In 1982, he drove a 1980 Monza for his 5th win. He won the event for the 6th time in 1988. In 1991, Ralph again visited victory circle on Pikes Peak, this timing driving for John Day & Sons Racing. 1992 was a momentous year for Ralph as he recorded his 8th victory for Quanz Boys Racing Team from Albuquerque. 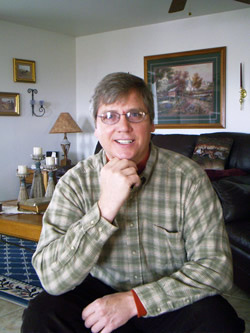 In 1998, Ralph was diagnosed with terminal pancreatic cancer. He did race with a chemo pack and oxygen strapped to his body. He finished second. Because of his determination, Ralph received the Sword of Hope Award from the American Cancer Society. In 2000, Ralph died peacefully at home with his family. Born and raised in Denver, Danny Collins was a fourth generation Colorado citizen. Collins successfully raced sports car and single-seat Formula cars for 50 years, including two years in England. In England, Collins was trusted to campaign a factory-owned Chevy Corvette in the 1962 Tourist-trophy at Goodwood, England, beating two World Champions in the process. Over the years, he raced Alfas, several Ferraris, a Mercedes-powered Special, Porsche, and a wide variety of single-seat Formula and two-seat racecars. 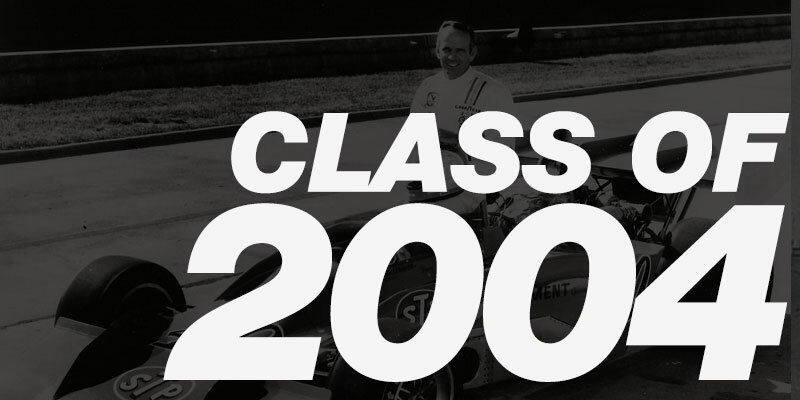 He trained and coached more than 3,000 race drivers, including Indy drivers Buddy Lazier, Greg Ray, Buzz Calkins, and many other champions on the professional and amateur levels. Danny designed many race tracks, including a 3.3-mile track at Stapleton, the 2.6-mile Continental Divide Raceway, formerly located at Castle Rock, the 1.7-mile Second Creek Raceway in Denver and the 1.55-mile Airport Circuit in La Junta, Colorado. He also consulted on the design of many other tracks, including the Ginger Man racetrack in Michigan. He also designed and built Formula Ford and F-Continental race cars, as well as creating an entirely new Formula Junior racecar to fill the need for a new high performance, low cost race car for beginners. 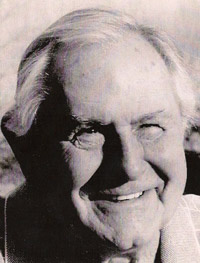 He co-founded and edited a car magazine in the 1960’s, Rocky Mountain Steering Wheel and edited Redline Express and Redline Chronicle, the official publication for the Colorado region, Sports Car Club of America, which was distributed to more than 1,400 members in eight western states. He also was appointed to the Sports Car Club of America’s Public Relations Committee and served as SCCA’s first Director of Licensing and Training, where he set up guidelines for SCCA’s Club Training Schools. 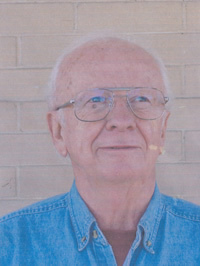 He also served as a Director for the Colorado Region Sports Car Club of America and Rocky Mountain Vintage Club. 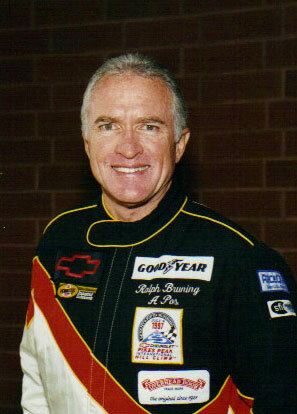 He passed away shortly after his induction into the Colorado Motor Sports Hall of Fame in 2004. At age 15, Wally Dallenbach, Sr. began building race cars and engines, turning a ’38 Ford Coupe into a stock car. Too young to participate as a driver, he campaigned the car for two seasons as an owner and mechanic, gaining invaluable experience in the mechanical and handling aspects of a race car. This later became important to him on a professional level in Championship Racing and tire testing for Goodyear. At the age of 17, a legal driving age, he switched to drag racing. In 1959-1960, he built one of the first successful rear-end dragsters. He then accomplished some 80 wins over a period of five years and, at the age of 21, he began oval racing. He promptly built another modified stock car and campaigned on the Eastern race tracks for more than four years, winning more than his share of races along the way. At age 24, he then switched to the mighty midgets and sprint cars for about two years to gain more experience driving open cockpit race cars. During his career, both in stock cars and Championship cars, Wally raced at many New Jersey and surrounding area tracks. In 1965, Wally received his first break in Championship Car Racing, driving an outdated roadster in Langhorne, Penn., then one of the roughest tracks on the circuit. He qualified 11th and finished 9th in his first Champ Car ride with obsolete equipment. His rookie year at the Indy 500 was in 1967 where he qualified 15th and was running well when he was sidelined with a broken rear axle on the 87th lap. In 1975 he led the Indy 500 for 97 laps when the engine failed with a burnt piston with only eight laps remaining, due to rain. Wally’s best year was in 1973, driving for Pat Partick’s S.T.P. Eagle, winning the Milwaukee 200. From there he went on to win the California 100 and the California 500, giving him a consecutive winning streak and finishing the racing season with a second place finish at Phoenix, which placed him second nationally in the point standings that year. Wally was approached late in 1979 about serving as CART’s Chief Steward. He had a few weeks to think about it, but little did he know that after accepting the position, he would one day return to the cockpit of an Indy car. After the first weekend of the Indy time trials was rained out, Mario Andretti, who was committed to drive in the Belgium Grand Prix the following weekend, asked Wally to qualify the car for him. Wally turned in a four lap average speed of 193.040 miles per hour, 12th fastest in the 33 car field. 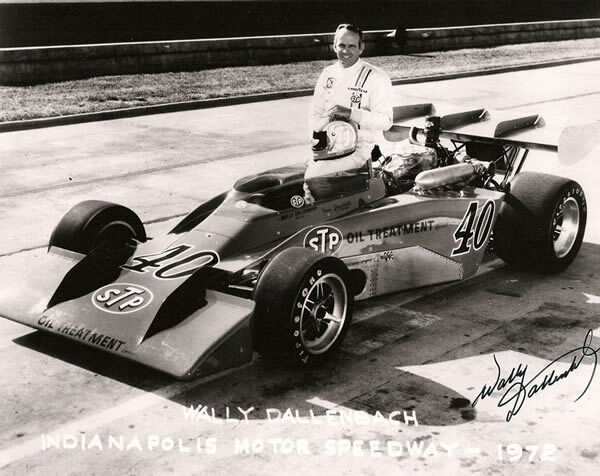 Wally competed in 180 Indy car races, winning five times. He raced in the Indy 500 13 times, finishing 4th in 1976, his best finish. He organized the Championship Driver’s Association in 1978 and was CART’s first driver’s representative. Wally retired as CART’s Chief Steward after 23 years. Wally continues to organize two Colorado 500 Charity Rides; a road bike ride in June and a dirt bike ride in September, both originating from his ranch in Colorado. These charity rides have improved the lives of many young people in Western Colorado through their donations and scholarships, which to date have dispersed well over $1 million. Arlo Englund’s first race was at age 14 in October, 1971, on a 90 cc Suzuki. His second race came shortly after and he won it. Arlo was then fortunate to get a sponsor, Robo Car Wash, and got his first racing bike in December, 1971, a 1972 Yamaha 125 MX. In 1972 Arlo competed in several races including the Pikes Peak Hill Climb. After becoming an SRAC Pro rider, he placed third in the 250cc Pro class in the state championship race. The goal for 1973 was to become the #1 250cc Pro rider, which was accomplished. In 1974 Arlo started competing in several out-if-state races to obtain his AMA Pro license. Arlo rode a four race qualifier series and ended in second place. This earned an invitation to race the International Moto Cross held in Baldwin, Kansas. Arlo also attended the Evel Knievel Moto Cross later that year and won the wheelie contest. Highlights for 1975 include first place 250cc Pro, second place 500cc Pro in the Mid America Moto Cross Championships in St. Peters, Missouri. In 1976 it was off to Florida Winter Series, where he placed fifth, and on to the national circuit. Experiencing a little bad luck and recovering from an injury, the return was good, placing third at a 125cc national in Ohio and 11th overall for the year. Arlo started with a sixth place finish at the first 125 125cc National in 1977 and digressed from there forcing Arlo to go back to Colorado and re-group. Arlo found a new sponsor and was excited to be on the Vickery Yamaha Racing Team. Spending more time at the local races got Arlo the number one in the 250cc class. Arlo went to California that fall and won the Consolation race at the Anaheim Super Cross. In 1978 Arlo decided to stay in Colorado, where he won the 250cc and 500cc State Championship. For 1979, it was a great year on the Vickery Yamaha placing second in the Florida Winter Series. In 1980 Arlo was back on the 500cc national circuit placing sixth overall. 1981 was Arlo’s last year to compete in National Moto Cross, placing ninth overall. In 1982, Arlo won the Pikes Peak Hill Climb in the 500 cc class and again in 1991 in the 250cc class. Roy wasn’t born with nitro in his veins, but he was barely out of short pants when his life-long love of cars and racing began. The Denver native started with a 1928 Model A that he modified with a V-8 engine. Soon, he was racing it, and others like it, on the streets and byways of the Denver area, long before official tracks allowed a proper racing venue. Military service temporarily interrupted his racing and car building hobby, but he reclaimed his interest upon his return to Denver in 1953. By that time organized racing was a regular occasion at Lowry Air Force Base, among other locations. The NHRA nationals, held in Kansas City in 1954, changed Roy’s attitude about racing. He built his first dragster in 1955, based on what he had seen in Kansas City. He raced on asphalt tracks in Scottsbluff, Neb., Kansas City and in Pueblo and Colorado Springs, Colo. It was around this time that the Denver Strippers, a hot rod club, was formed with Roy as a charter member. They helped to organize races and worked on cars together. Roy’s record-breaking race, the first in Colorado to reach 160 miles per hour, came during a routine afternoon of racing. He had flirted with speeds in the 145 to 148 miles per hour range, but the celebration began as soon as his parachute opened that day in 1958. Never afraid of trying new things, he was also the first Colorado racer to use 100 percent nitro as fuel, which others had been afraid to try. His fastest speed was 216 miles per hour in 1965. He served as a member of the pit crew for the Frantic Four out of Pomona, Calif., and worked on their cars whenever he had a chance. While he quit driving in 1966 due to the financial burden, he didn’t quit racing. He continued as a pit crew member at the Baja, Calif. races with VW Beatles in the ‘70s and played the same role in off-road races throughout the decade. 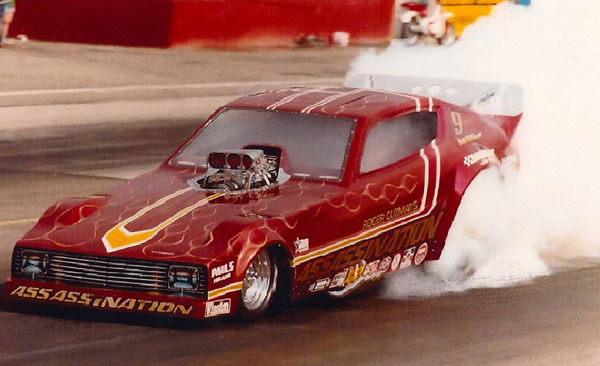 Roger Guzman and his brilliant succession of funny cars named “Assassination” became household names to America’s drag racing fans during Guzman’s 26-year career that spanned four decades. In a world where drivers are the stars, no one was better known among spectators, or more respected by competitors, than car owner and engine builder, Guzman. Guzman campaigned 19 incarnations of Assassination race cars, beginning in 1965 with a BB/Modified ’61 Corvette co-driven by Art Ward, and ending in 1984 with a new Chevy Citation AA/Funny Car also piloted by Ward. In between, Guzman’s funny car creations vaulted two other Colorado drivers to national prominence, John Dekker (1969 – 1974) and Rob Williams (1977 – 1983). Ward drove Assassination quarter-milers from 1965 – 1968 and 1975 to 1976 before the fabled duo’s final appearance in 1984. Dave Strickland knew he wanted to race cars after competing in the Soap Box Derby race in Englewood, Colorado at about 10 years old. Strickland tried his hand at drag racing, running a ’37 Chevy pickup with a Corvette engine in Lodi, California, and again at the infamous 1955 NHRA Safari race at Lowry Field with a ’46 Ford. But, drag racing wasn’t what Dave wanted to do. Circle track racing was in his blood. Dave owned and ran a ’34 Ford stock car on the dirt at Englewood Speedway. He had the “circle track” fever and wanted to run something stronger than a stock car. Getting a ride in these days wasn’t easy. You either had to buy into a car of have a reputation for being a winner. In the early 1960’s, Dave got a ride in Harvey Wood’s 327 Chevy sprinter and won his first sprint car race in Norton, Kansas. Dave then moved to California so that he could race year round, and finally got a ride in a midget. In 1966 he finished second behind Bill Vukovich Jr. in the Bay Cities Racing Association points standings. He also won the Northern Broadcasters Driver of the Year Award. Dave’s first ride in an Indy car was at Phoenix. In a normally aspirated 270 Offy, he ran sixth against the Unsers, Andrettis and others who were running turbo charged cars. Outstanding for a rookie, Dave was familiar with the track and felt comfortable in the car. Needless to say, Strickland’s future was cast in stone. He was a circle track racer in many cars, including midgets, sprint cars and Indy cars. In 1967 Dave joined The United States Auto Club, where he finished 20th in point standings. In 1968, he was 50 in the standings, and in 1969, he moved up to third. 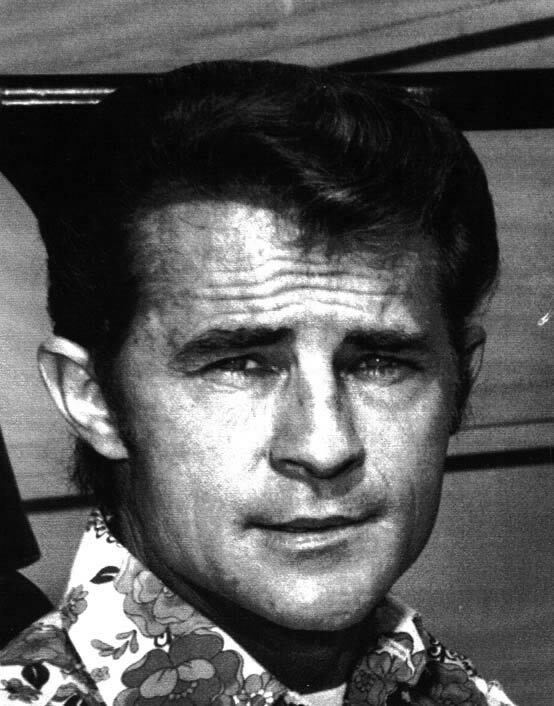 In 1970, Strickland placed second in the USAC point standings. In 1970, Dave moved up to Champ cars and was one of 26 drivers who were invited to Argentina to drive a three-mile paved oval. It was the first race ever on the track and Dave was to drive Barney Navarro’s Nash Rambler twin turbo entry. The car was the fastest car Dave had ever had driven. It was clocked at 230 miles per hour and the motor lived long enough for Dave to finish in 20th position. He was then asked if he would drive the car at Indy the following year. He jumped at the chance even though the chassis wasn’t reliable. They took the car to Phoenix for tire testing and Dave felt that they had solved the chassis problem. However, the trip to Indy was a disaster. The Nash engine, which had performed so well in Argentina, developed one problem after another. The end came when Dave was going down the backstretch at over 200 miles per hour and he felt something strange with the race car and coasted the final turn and into the pits. The pit crew couldn’t understand what had happened. When they raised the front end, the front wheel came off. That was it for Indy. Strickland went back to midgets from 1971 to 1973 and raced in New Zealand and Australia for three months each year. He was world champion twice and won the Bob Tattersall Memorial two times. When Dave came back from New Zealand, Dave had a very serious accident in Phoenix. After recovering, Dave won the Rocky Mountain Midget Racing Association championship three years in a row. Dave was then inducted into the National Midget Hall of Fame in 1996. Dave passed away in 2006. Fritz Wilson began his career racing motorcycles when he was a teenager and graduated to stock cars in 1947. He won the first stock car race he entered that season. He went on to win several modified and late model championships at Colorado National Speedway, Englewood Speedway and Lakeside Speedway, and competed at tracks across the country. Wilson took part in the Grand National Series, now NASCAR, for three seasons (1959, 1960 and 1965). He never won a race in the series but earned three top-five and four top-10 finishes Yet, Wilson is remembered fondly for accomplishing a particular feat in the series in 1959. After qualifying in the No. 3 position, he was the first driver to lead the Daytona 500 in its inaugural race. However, the 500, the third event of 44 on the series that year, wasn’t a successful venture for Wilson. He was forced to retire on the 15th lap because of a blown piston and finished 56th in the 59-car field. He earned $100, while the winner, Lee Petty, collected $19,050. Wilson’s car in that event, a 1959 Ford Thunderbird, was placed in the Daytona 500 Museum. Wilson also competed in the Pikes Peak Hill Climb. In 1965, he finished second in the open wheel division to Parnelli Jones. Wilson also won the Sahara Late Model Open in 1975 in Las Vegas, one of the biggest national wins of his career. Wilson also was cited as one of the drivers who helped pioneer the tactic of drafting in stock car racing. He retired in the late 1980s. Darrell Zimmerman ran in the A Gas Dragster and A Dragster classes, winning 176 trophies and 26 top eliminator awards, while setting 22 track records during his career. He helped form the West Central Drag Association that was the forerunner of the National Hot Rod Association’s West Central Division. In 1961, he became the Director of the NHRA West Central Division, a post held until his retirement in 1995. The division covered nine states and Manitoba, Canada. 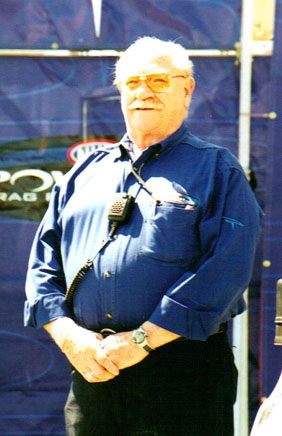 Darrell has helped develop many noted drag strips and NHRA events.